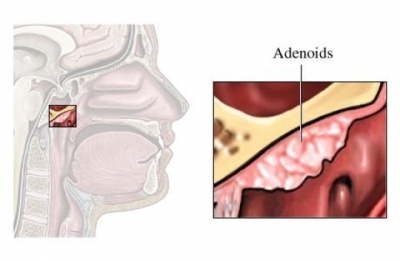 Adenoidectomy is the removal of the adenoids. The adenoids are located in the back of the nose near the throat. They are thought to help with immunity against infections in children. Do not eat or drink at least 8 hours before your procedure. The adenoids will be removed through the mouth or nose. A scalpel or other tool removes the adenoids. An electrical current can also be used. Gauze packs will be placed at the site of the prevent bleeding. Radiofrequency ablation is a type of procedure that uses heat to destroy tissue. It can decrease the volume and size of the adenoids. This method often has less bleeding. It also seems to cause less pain. You will be watched in a recovery room until the anesthesia wears off. Anesthesia will prevent pain during surgery. Medicines are used to ease pain afterwards. Sometimes, you can leave on the same day. Your doctor may choose to keep you overnight if there are problems. Don't forcefully blow your nose. Redness, swelling, pain, or pus from the nose or mouth. Increased swelling or redness of the eyes. Pain that can't be controlled with the medicines you were given. Adenoidectomy. Canadian Society of Otolaryngology—Head and Neck Surgery website. Available at: http://www.entcanada.org/public2/patient8.asp. Accessed July 2, 2018. All about adenoids. Kids Health—Nemours Foundation website. Available at: http://kidshealth.org/en/kids/adenoids.html. Updated April 2016. Accessed July 2, 2018. Shehata EM, Ragab SM, Behiry AB, Erfan FH, Gamea AM. Telescopic-assisted radiofrequency adenoidectomy: a prospective randomized controlled trial. Laryngoscope. 2005;115(1):162-166. Tonsils and adenoids. American Academy of Otolaryngology—Head and Neck Surgery website. Available at: https://www.entnet.org//content/tonsils-and-adenoids. Updated April 6, 2012. Accessed July 2, 2018.